Xbox ONE/Xbox 360 Only! Unlock All (Calling Cards, Diamond Camos, etc). Legit/Custom Stats. MW3 UPC 047875842069. Includes both cases and discs. Tested and working well. 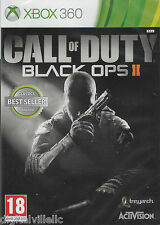 Call Of Duty Black Ops 2 (Xbox 360). Condition is Good. Shipped with USPS First Class Package. Includes case, both discs and instruction manual. Good working condition, my son just no longer plays his XBOX. CALL OF DUTY: BLACK OPS Collection 1, 2 XBox 360 - Lot of 2 Games - Tested. Condition is Like New. Shipped with USPS First Class Package. Game has been tested & is in good working condition. Game comes complete with disc, case, & inserts. Game has surface scratches but gameplay isn’t affected. Any DLC codes are untested & considered used. Selling to the U.S. & through eBay's global shipping program. Thanks for looking! Pre-owned and in good condition. They may or may not. Call of Duty: Black Ops 1 & 2 (Microsoft Xbox 360, 2015). Condition is Very Good. Shipped with USPS Media Mail. HAS ALL PAPERWORK SEE PICTURES. Call of Duty: Black Ops 1 & 2 (Xbox 360) CIB Complete -Very Good- FREE SHIPPING! Call of Duty: Black Ops 1 & 2 (Xbox 360) CIB Complete -Very Good- FREE SHIPPING!. Condition is Very Good. Shipped with USPS First Class Package. Discs have no noticed scratches. Very good!! FACTORY SEALED! Call of Duty. The object for sale is ONE item (unless otherwise indicated). (SPECIAL PRICE). You can expect the item to arrive as described. Unravel the mysteries of a dying Earth in Tranzit, fight endless waves of zombies in Survival mode, or compete in the new 4z4 last-human-standing mode, Grief. The Biggest Zombies Experience to Date. Zombies: Shotgun rank. Xbox ONE/Xbox 360 Only! This title is fully compatible with both Xbox 360 AND Xbox One consoles! Format: Microsoft Xbox 360 / Xbox One Compatible. Our reputation for service should speak for itself. We operate in USD. Tab 6 Content. Works on Xbox one! Insert included. PICTURE SHOWN IS ACTUAL ITEM(S) RECEIVED. COD Call of Duty: Black Ops 2 II (Microsoft Xbox 360, 2012) BO2 Complete. Condition is Very Good. Shipped with USPS First Class Package. Xbox 360 6 Call of Duty games. Some have some scratches but they all work. You get the games pictured with cases. Free FAST US shipping! Have a great day and thanks for looking! 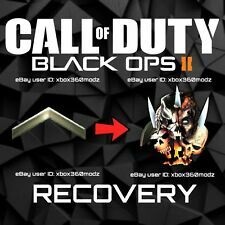 Call of Duty: Black Ops II and Far Cry 3 2 GAMES! (Microsoft Xbox 360, 2012). Condition is Good. Shipped with USPS First Class Package. NEW NEVER USED. The object for sale is ONE item (unless otherwise indicated). (SPECIAL PRICE). Xbox 360 Call Of Duty Black Ops 2 - Hardened Case Edition steelbook. Condition is Very Good. Shipped with USPS First Class Package. Disc has a moderate amount of scratches. Games are sold as is and returns will not be accepted. Please see pictures and description for condition. Platform : Xbox 360, Xbox 360. greatest hits, platinum hits, or the player’s choice label. Condition : New. Playstation 3. Playstation 2. Xbox 360 Game Discs & Boxes ...Diablo, Dark souls 2 Call of Duty Black Ops II. Condition is Very Good. 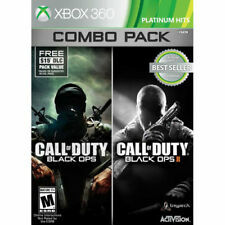 XBox 360 Call of Duty Black Ops 2 Activision Condition is Very Good. Shipped with USPS First Class Package. Call of Duty: Black Ops 1 & 2 (Microsoft Xbox 360, 2015). Condition is Good. Shipped with USPS First Class Package. This is the XBOX 360 version. Platform: Xbox 360. If you HAVE. All of the major websites and identification books break down the toys this way and so do I. Note: Can be played on the Microsoft XBOX 360 Only. Platform: Microsoft Xbox 360. Part #: COD-BLK-OP1-2-X3-N. There is always a way to fix a problem. Shipped with USPS First Class Package. Games are all complete and are in good working condition.